Map-Me (“Mapping Meanings”) is an online Public Participation GIS (PPGIS) for the creation of online surveys for the collection of ‘vague’ spatial data. Based upon a “spray and say” approach, Map-Me uses an ‘airbrush’ interface (the “Spraycan”) to allow participant’s to “spray-paint” on to a Google Map, in order to answer vague spatial questions (e.g. “Where you think…?”) without being required to artificially enforce precise boundaries onto their data. In 2011, some colleagues and I released an online participatory mapping platform called Map-Me (mapping-meanings). It was based upon some work I had done several years earlier, in which I had made an ‘airbrush’ interface (called the Spraycan) for collecting data on a Google Map. The idea for this was, in turn, based upon earlier work by Andy Evans and Tim Waters, who had created a similar ‘airbrush’ interface using a Java Applet. From 2009, the ‘Spraycan’ Public-Participatory GIS (PPGIS), was used in a number of commercial and academic projects before finally being released on the map-me website, where it can still be found today, and is free to use for everyone. Map-Me is essentially a survey-generation website. 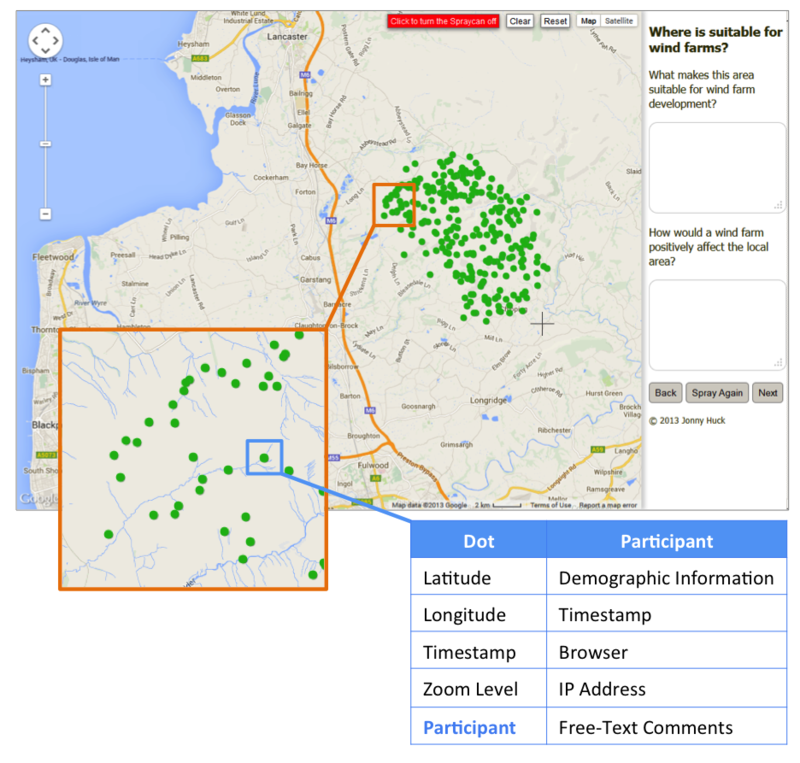 Users are able to generate a survey that comprises a number of form-based questions (to collect data on participant demographics, for example) and then a number of spatial questions that participants can answer by ‘spraying’ onto the map and adding contextual free text comments that are associated with the spray patterns (normally explaining what they are spraying). The data collected from participants’ spray patterns are stored in a relational multipoint database, which stores the raw ‘dots’ of paint that have been sprayed on the map, and associates them with the text comments and other information that has been collected about the participant. An illustration of the data structure of each ‘dot’ in the Spraycan PPGIS. The importance of the airbrush-style interface over traditional points, lines and polygons is that it is designed in order to capture and represent the vague geographical thoughts and feelings of participants more effectively than is possible with the more traditional representations, which are principally designed for ease of storage and analysis. For example, if you asked someone to mark where they considered to be the ‘rough end’ of a town, or where they considered to be a ‘wilderness’, or even where they thought of as their ‘neighbourhood’, you might quickly find that these types of geographical entities do not lend themselves well to the definition of precise boundaries. With the Spraycan, however, they can mark these areas onto the map without having to consider the boundaries, which is much more akin to how most people think about areas such as these in their daily lives. If someone asked you to meet them ‘downtown’, for example, you wouldn’t spend time considering where the boundary of ‘downtown’ was, you would just go there – so why should drawing the area onto a map be any different? 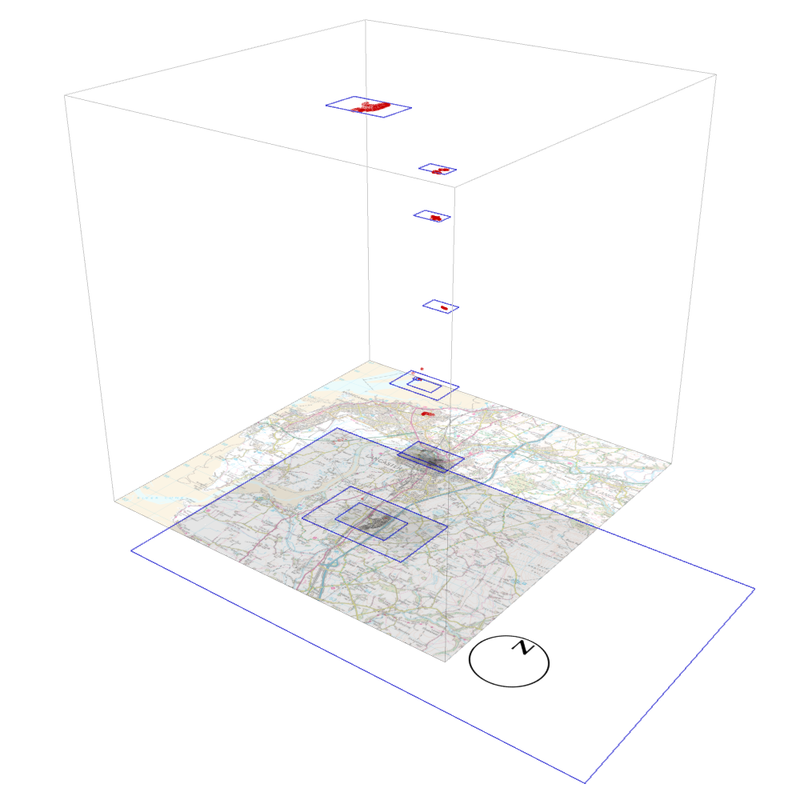 The key characteristic of Map-Me is therefore that at no point in the creation, storage or visualisation of these data is a boundary defined by the software. Rather, indeterminate regions are represented by a collection of ‘dots’ with shared attributes. Whilst each ‘dot’ is, of course, a precise coordinate pair behind the scenes, the key aspect of this data model is that the dots have not been, and cannot be, precisely located by the user; and that the dots associated with a particular place are only ever considered as a single entity (a “multipoint” collection), never as individual dots. As might be expected, this map shows a great deal of perceived segregation between the residential areas that are occupied by Catholic and Protestant communities, with relatively few areas denoted as mixed. There are also low levels of disagreement between the various groups (red, green, blue, black), reinforcing the notion of a ‘shared understanding’ of boundaries existing between communities. Though the individual dots are stored as conventional coordinate pairs and represented as precise geometric points, the manner by which they are created and the resulting visual effect is one of indeterminately bound regions that will be interpreted differently by each individual, just as each individual participant defined them differently during the survey. The inherent indeterminacy in the multi-point patterns allows each individual to interpret the findings in their own way, which will be unique to that particular individual and application. If the user wishes to then quantify these results, then this is simple to do in a GIS with a variety of spatial analysis techniques such as density analysis, cluster analysis and so on. The important thing is that the system does not dictate how this formalisation must take place, and so permits freedom of interpretation that is not often found in participatory GIS. Another benefit of Map-Me is that it collects a lot of metadata about participants’ spray, allowing you to examine not only where users sprayed on the map, but how. For example, the below space-time prosm uses the associated millisecond-timestamp and map bounds information to examine how a user interacted with map-me whilst spraying their data onto the map. Click here to go to Map-Me! Huck, J., Whyatt, J.D., Yielding, S., Stanford, H. & Coulton, P. (2013). Development and application of a “spray-can” tool for fuzzy geographical analysis. In Proceedings of the 21st GIS Research UK Conference. Sanchez-Trigueros, F., Carver, S., Huck, J., Matt, R., McBride, B., Moon Stumpff, L. & Watson, A. (2014). Fuzzy tagging and processing of semantic vagueness for crowd-sourcing public perceptions of environmental change. In: Digital conservation: understanding the impacts of digital technology on nature conservation, The University of Aberdeen, UK. Sanchez-Trigueros, F., Carver, S., Huck, J., Matt, R., McBride, B. & Watson, A. (2014). The treatment of public participation data in environmental impact assessment: setting up smart systems for the synthesis and mapping of vague definitions. In: Proceedings of the GIS Research UK 22nd Annual Conference: The University of Glasgow 16th-18th April, 2014. Drummond, J. (ed.). Glasgow: Geomatic Group, University of Glasgow, Vol. 1, p. 178-198. Evans, A.J. & Waters, T. (2007). Mapping vernacular geography: web-based GIS tools for capturing “fuzzy” or “vague” entities, International Journal of Technology, Policy and Management, 7(2): 134-150. Waters, T. & Evans, A.J. (2003). Tools for web-based GIS mapping of a “fuzzy” vernacular geography. Proceedings of the 7th International Conference on GeoComputation.